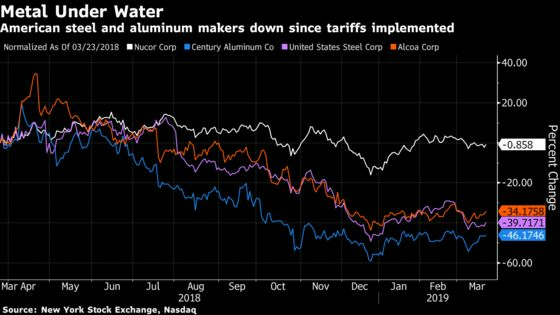 (Bloomberg) -- So far, trade wars don’t seem to be as "good, and easy to win" as U.S. President Donald Trump promised a year ago when he imposed tariffs on steel and aluminum imports. To be sure, there are supporters of the tariffs. U.S. Commerce Secretary Wilbur Ross, for instance has downplayed the tariff’s negative effects. Appearing on CNBC at one point, he used a soup can to say most Americans would barely notice the tariffs. The can contained 2.6 cents worth of steel, he said, adding, “if that goes up by 25 percent, that’s six-tenths of one cent." That fear was somewhat realized, with shipments into Europe -- largely from Turkey -- increasing about 12 percent last year to the highest level since 2007. That provoked the European Union to implement its own protectionist measures, called safeguarding, that caps the amount of tariff-free imports to the region. U.S. imports of aluminum and aluminum products from the EU grew by about 17 percent to $1.72 billion in 2018 compared with the previous year, he said. Meanwhile, the European industry has been pushing for a broader deal to address "China’s unfair subsidized aluminum overcapacity,” Götz said. Robust steel prices in China, driven by supply-side cuts and sustained domestic demand, has made it more profitable for Chinese mills to sell to the home market than to export.